As significant and reliable a gift to fandom as its sister publications Starlog and Fangoria, vintage publication Comics Scene was regarded as a pre-internet bible for the medium and its various transitions to the big & small screen. Indeed, arguably the most compelling aspect of the magazine were ‘The Comics Screen’ found in the back pages which featured an alphabetical list of all the comic-book based films either in production or ‘development hell’ where many would languish (and remain unmade to this day). 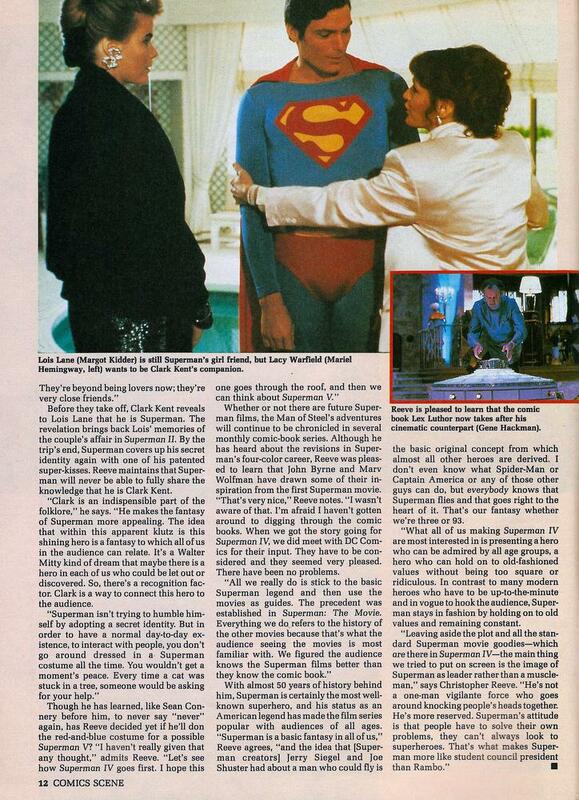 Toward the end of the ‘S’ column in Issue #1 of the second volume (the first being a short run between 1982-83), however, Superman IV was not only listed as in release but also on the cover of the special (top pic) for the start of a revival of the periodical which would last until 1996. 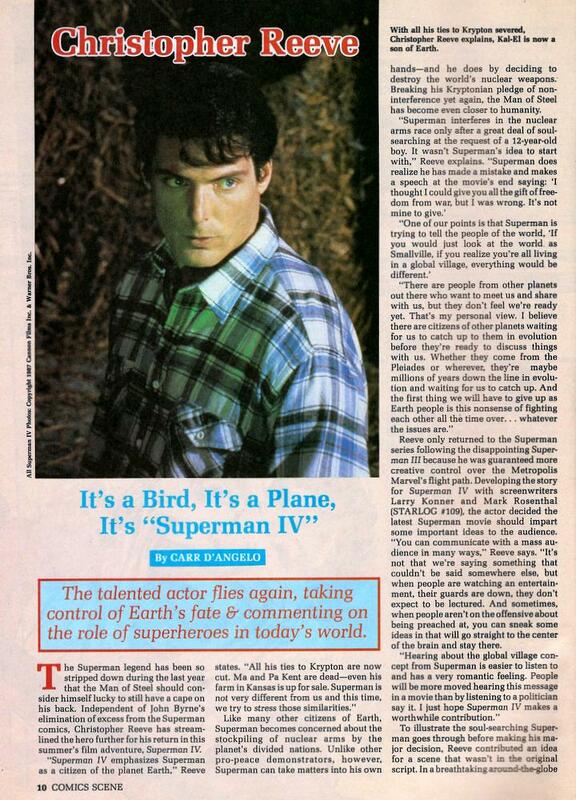 Consistently running pieces on the comics industry alongside the cinematic adaptations, the Superman double-whammy would be interviews with actor Christopher Reeve and comic-book writer/artist John Byrne, who, on the back of his huge success with origin-revision Man of Steel was now heading up the monthly Superman book. While Byrne speaks candidly about his process of ‘clearing off the barnacles’ from fifty years of mythos to get back to basics, Reeve offers his personal insights into the development of the character and his recent intervention in the arms race (above). Thanks for sharing these historic scans. 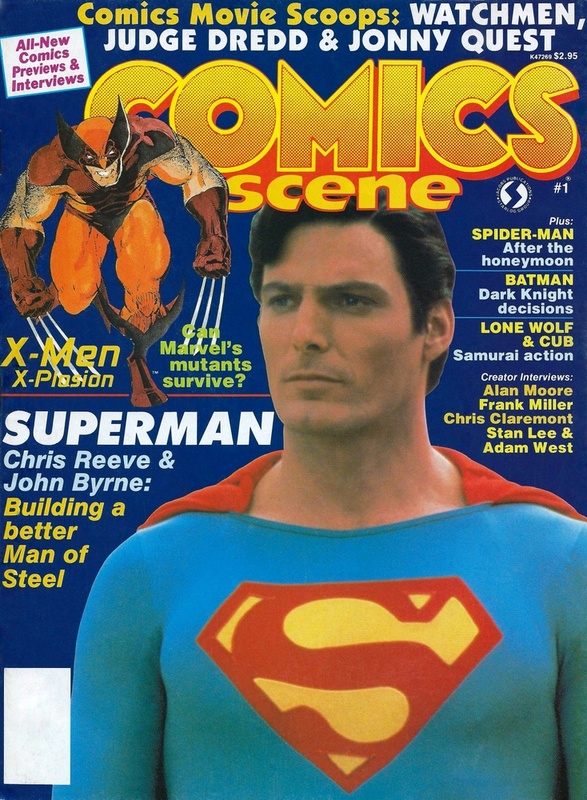 “Comics Scene” certainly did a great job in its day of reporting on Superman’s film incarnations, as well as then-current television and 1966 Broadway versions as well. Internet innovations such as Facebook have provided great new ways for shared-interest communities to communicate…but it’s a same that they have also contributed to making print publications such as “Comics Scene” unprofitable ventures. Thanks for your comment Brian! 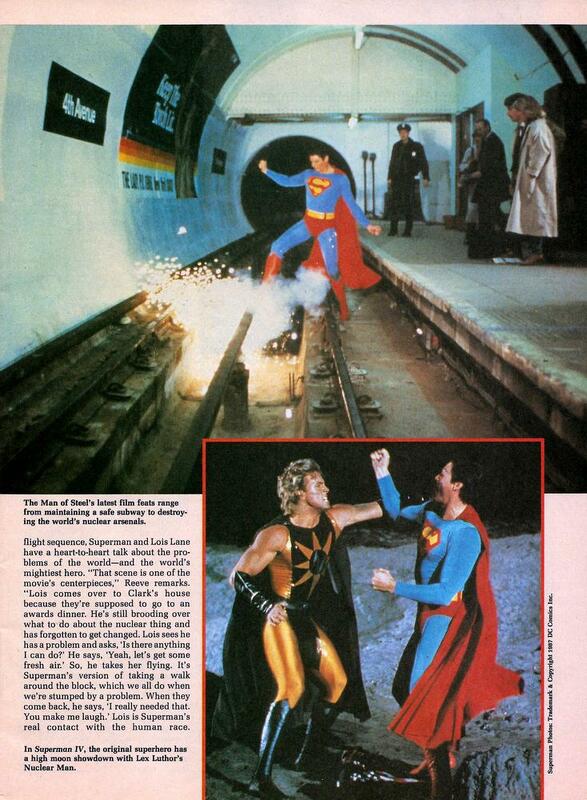 Superb a publication as it was, like Starlog itself progress condemned them to history. When you look back at them now however its amazing just how much info they crammed in to each issue – this one covers at least twenty different superhero titles with interesting stuff – no filler. I have many back issues and they are all precious, even beyond the wave of nostalgia. Gosh, . . .How I miss this stuff. I used to look so forward too picking up these types of sci-fi magazines at the new stand or local grocery store. Both when I was a kid and later when I was a young adult. Now unfortunately, most of them have gone the way of the Doo-Doo bird. Thanks for all the great pics and articles. Big smiles here. SUPERMANIA is a fan-based website online since May 2010. SUPERMAN and all related elements TM and © DC Comics. © 2019 Warner Bros. Entertainment Inc. No copyright infringement intended.